The bicycle ambulance prolongs the life of people in need of urgent medical care in Africa. Photo by Transaid. In the African nation of Uganda, where many areas are difficult to access and have limited resources, bicycles are saving lives. Bicycle ambulances, modified to pull a covered stretcher in back, allow an individual experiencing a medical emergency — and even pregnant women — to be transported to medical facilities quickly. This alternative has already saved many lives in a community that previously had no access to any type of transportation. The bicycle has become essential, both in bringing patients to the hospital and in transporting health professionals and medicine to the community. The impact of the bike has not gone unnoticed by organizations and institutions worldwide, that have come onboard to support the cause. These include: Bike4Care, linked to Cycling out of Poverty; the Make a Move campaign, and the First African Bicycle Information Organization (FABIO). In emergency cases, a motorized ambulance is the best option in terms of speed and access to medical care. 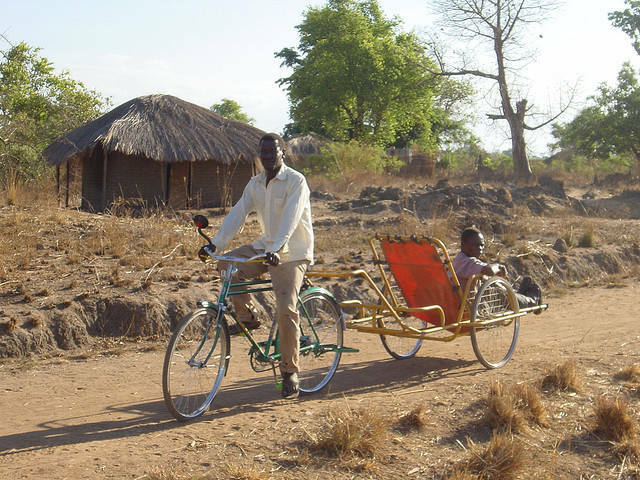 But at this time, the bike is the most economically viable solution for people in villages like Katakwi, Uganda, and it is proving its worth, saving lives and raising life expectancy. What would happen if alternative were implemented in other areas of globe, where people have poor access to health care? What you think?